This recipe was inspired by Tiffany at Eat at Home! She posted a recipe for an Italian Chicken and Rice Casserole that sounded delicious. 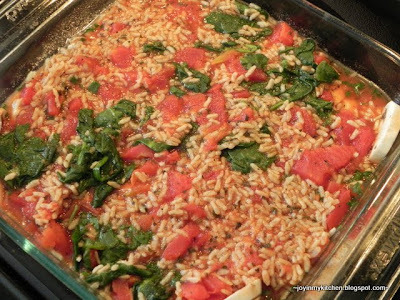 I took that idea and ran with it - using what we had in our fridge and freezer to create a make-ahead rice bake. 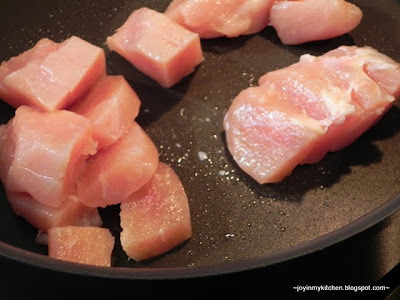 Begin by dicing up the chicken and cooking it in a large skillet coated with olive oil over medium heat. Season with garlic powder, and pepper and cook until chicken is browned and cooked through. 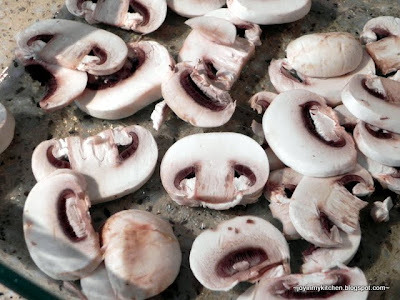 Meanwhile, slice up the mushrooms, and lay them in the bottom of a lightly greased 8x8 glass baking dish. 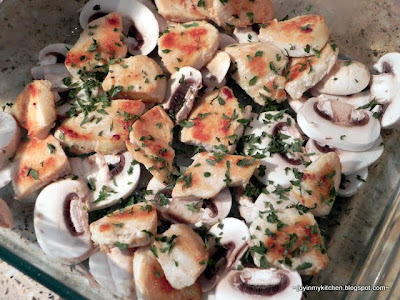 Remove the chicken from the skillet when cooked, and place atop the mushrooms. Sprinkle with parsley. 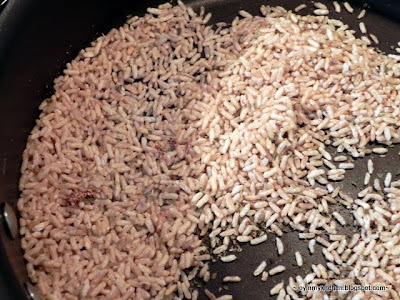 Then, pour the uncooked brown rice into the skillet. 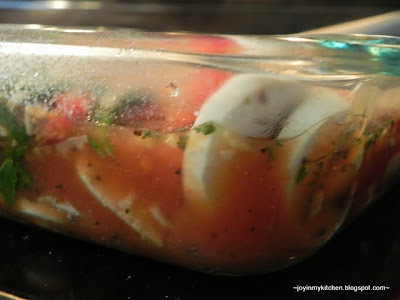 Add the tomatoes, chicken broth and seasoning. 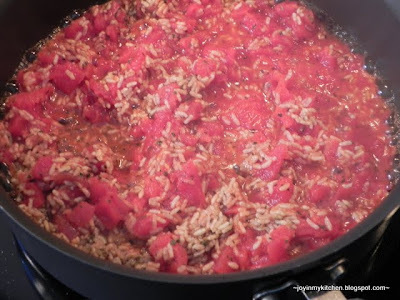 Bring to a simmer and cook about 5 minutes. 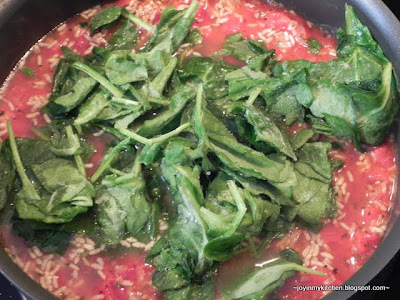 Then, add in the spinach. I used frozen. 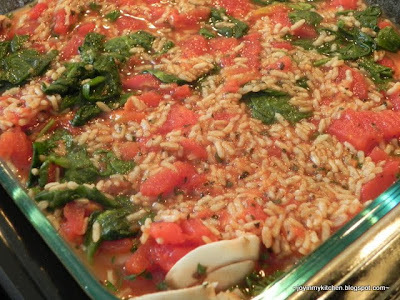 Simmer until spinach is wilted. Then, pour into the lightly greased 8x8 baking dish containing the chicken and mushrooms. There will be lots of excess liquid -- and that's good! At this point, you can cover and refrigerate the dish until you need it. If you are baking immediately, continue with the directions below. Preheat the oven to 350. Meanwhile, sprinkle the dish with shredded cheese. 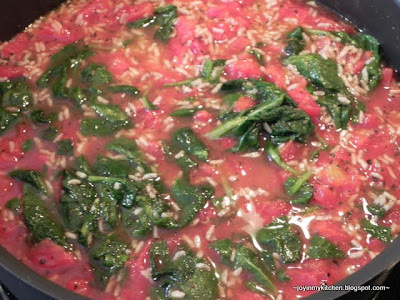 Bake at 350 for ~45 minutes until the liquid is absorbed, rice is tender and cheese is lightly browned. Allow the dish to sit for 5 minutes before serving. Oh, this is ooey gooey cheezy good! It looks delicious and I'm sad to say I missed dinner at your place again! Yum! That looks and sounds delicious!! I believe I have everything on hand to make it. My dinner plans may have to be changed!! Thanks!! Yum! This looks so yummy and colorful!!! I made this this morning for dinner tonight and had some trouble. There was so much liquid that it didn't all fit in my 8x8 pan. I'd probably use a larger one next time. Also, the rice didn't come close to baking in the 45 minute bake time. The cheese was browned, but the rice was still very crunchy and the casserole very watery. I put it in the oven for an additional 20-25 minutes and while it's still watery, the rice seems cooked. I have high hopes for it being delicious tonight! Thanks for stopping by! I'd love to hear from you; especially how you're finding JOY in your kitchen. Join with our community - 26 cents feeds 1 child. Copyright S.W. 2009-2013. Simple theme. Powered by Blogger. 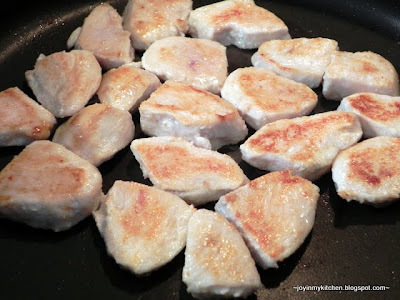 When cooking, please make sure to follow kitchen hygiene and safety -- cook meat until internal temperature is at safe levels, always check labels for allergens, and use caution in the kitchen -- I love sharing recipes, but I am not liable for damages done as a result of trying these recipes.